The Lloyd P. Jones Gallery Photograph Collection was transferred to the University Archives from Facility and Real Estate Services in May 2014 (Accession number 2014: 019). The Lloyd P. Jones Gallery Photograph Collection is organized into two series: Frank Ross Photographs and Nova Studios Photographs. Each series is further organized into subseries based on the binders where the images were originally housed. Each subseries is arranged according to its original order. The Lloyd P. Jones Memorial Gallery was dedicated on November 11, 1972 in the first floor of the Gimble Gymnasium by the family of Lloyd Peniston Jones (1895-1971). Jones was a 1907 graduate of the University of Pennsylvania, where is track performance won him a spot on the 1908 Unites States Olympic Team. The Gallery consists of works by noted sculptor and Penn professor R. Tait McKenzie (1867-1938). 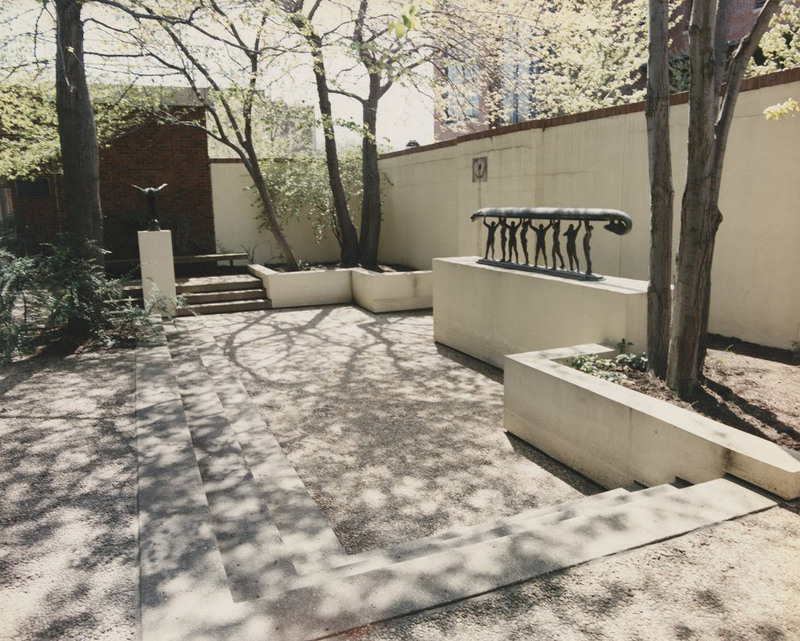 The gallery was expanded to include the Harry Fields Gallery of the Sculptures of Joe Brown shortly after the death of Dr. Harry Fields (1911-1986). Fields had been a student athlete at Haverford College and wrestled professionally to pay is way through the University of Pennsylvania’s Medical School. In 1965 Fields was tasked by President Gaylord Harnwell to reform the University’s athletic program. The addition of the Fields Gallery included many works by athlete and sculpture Joe Brown (1909-1985) who had apprenticed under McKenzie for seven years. In 1998 the galleries were removed from Gimble Gymnasium to allow for construction of a new fitness center. To make the artwork more accessible to the general public, the galleries are now displayed in the Samson Common in public areas of the University Bookstore, Inn at Penn, and Faculty Club. The Lloyd P. Jones Gallery Photographic Collection consists of professional photographs documenting the galleries and sculptures while it was located at the Gimble Gymnasium. The first set of photographs was taken by Frank Ross, and consists of individual photographs of the R. Tait McKenzie sculptures. The second set was taken by Nova Studios, and consists of negatives, contact sheets, prints and a photograph log for 28 rolls of film that document the gallery including the works by Joe Brown. The photographs in this collection are for reference purposes only. Requests for rights and reproductions of individual sculptures should be referred to the Office of the Curator. Additional information on the Lloyd P. Jones Gallery can be found in the News and Public Affairs Records (UPF 8.5). Additional information on R. Tait McKenzie can be found in the R. Tait McKenzie Papers (UPT 50 MCK37). Office of Facilities and Real Estate Services. 1 “The Modern Discus Thrower” Bronze Sculpture, 30 in. n.d.
2 “The Eight” Bronze Sculpture, 9 ft. 3 in. x 26 in. n.d.
4 “The Plunger” Bronze Sculpture, 20 in. n.d.
5 “Violent Effort” Mask No. 1 Bronze Sculpture, 12 in. ; “Fatique” Mask No. 2 Bronze Sculpture, 12 in. n.d.
6 “Exhaustion” Mask No. 3 Bronze Sculpture, 12 in., “Breathlessness” Mask No. 4 Bronze Sculpture, 12 in. n.d. Masks of Expression Bronze n.d.
7 “Joy of Effort 1912” Bronze Sculpture Medallion, 43 in. diameter n.d.
8 “Crawford C. Madeira” Bronze Plaque, 10 in x 14 in. n.d.
9 “Olympic Hurdler, Lord Burghley” Plaster Bronze Color Relief, 44 in. x 32 in. n.d.
10 “Olympic Shield” Plaster Bronze Color Sculpture, 60 in. diameter n.d.
11 “The Punters” Bronze Sculpture Medallion, 43 in. diameter n.d.
12 “Radiance” Bronze Sculpture Medallion, 18 in. diameter n.d.
13 “Relay” Plaster Sculpture, 50 in. x 15 in. n.d.
14 “Relay Carnival” Bronze Medallion, 18 in. diameter n.d.
15 “The Recruiting Party” Plaster and Wood Relief, 13 in. x 27 in. n.d.
16 “Strength” Bronze Medallion, 12 in. diameter n.d.
17 “Speed” Bronze Medallion, 12 in. diameter n.d.
18 J. William Wight Portrait Bronze Sculpture and Wood, 72 in. x 18 in. n.d.
19 “Athelete” Bronze Sculpture, 17 in. n.d.
20 “Aviator” Plaster Sculpture, 39 in. high n.d.
21 “Boxer” Bronze Sculpture, 16 in. hight n.d.
22 “Competitor” Bronze Sculpture, 21 in. high n.d.
23 “Capt. Guy Drummond” Plaster Sculpture, 39 in. high n.d.
24 “The Flying Sphere” Bronze Sculpture, 27 in. n.d.
27 “Robert H. Michelet” Plaster Sculpture, 29 in. high n.d.
28 “Onslaught Football Play” Bronze Sculpture, 3 ft. x 2 ft. x 2 ft. n.d.
29 “The Pole Vaulter” Bronze Sculpture, 22 in. high n.d.
30 “Relay” Bronze Sculpture, 22 in. high n.d.
31 “Standing Athlete” Bronze Sculpture, 18 in. high n.d.
32 “The Supple Juggler” Bronze Sculpture, 15 in. high n.d.
33 “Triumph of Wings” Bronze Sculpture, 46 in. high n.d.
34 “The Youthful Franklin” Bronze Sculpture, 35 in. high n.d.
35 “American Physical Education Association” Cooper Medallion Seal, 10 in. diameter n.d.
37 “William Carr Portrait” Sketch No. 1 Bronze Sculpture, 10 in. n.d.
38 “William Carr Stride” No. 2 Bronze Sculpture, 10 in. n.d.
39 “The Champion (D. G. Lowe)” Bronze Sculpture, 10 in. n.d.
40 “High Jumper Cleaning Shoes” No. 2 Bronze Sculpture, 10 in. n.d.
41 “Diver Sketch” Bronze Sculpture, 10 in. n.d.
42 “Grotesque, Why Not?” 4 Arm Boxing Bronze Sculpture, 10 in. n.d.
43 “Handball Player” Bronze n.d.
44 “Poet Roy Helton” Bronze Medallion, 10 in. diameter n.d.
45 “High Jumper, Cleaning Shoe” No. 1 Plaster Sculpture, 10 in. n.d.
46 “The Loop” Bronze Sculpture, 10 in. n.d.
47 Medals Gold Plated Bronze n.d.
48 “The Modern Discus” Bronze Sculpture, 12 in. n.d.
49 “The Relay Runner” No. 1 Bronze Sculpture, 10 in. n.d.
50 “Safe at First” Plaster Sculpture, 7 in. x 3 in. n.d.
51 “Grotesque, Why Not” No. 1 Shot Put Bronze Sculpture, 10 in. n.d.
52 “Shot Put, The Hop” Bronze Sculpture, 10 in. n.d.
53 “Shot Put, Preparing” Bronze Sculpture, 10 in. n.d.
54 “Shot Put, Ready” Bronze Sculpture, 10 in. n.d.
55 “Shot Put, Resting” Bronze Sculpture, 10 in. n.d.
56 “The Sprinter” Bronze Sculpture, 12 in. n.d.
57 “Sullivan Award, AAU” Gold Plated Bronze, 6 in. diameter n.d.
Lloyd P. Jones Gallery Brochure n.d.
58 “Taking the Count” Plaster Sculpture, 5 in. x 2 in. n.d.
59 “Head on Tackle” Bronze Sculpture, 9 in. x 3 in. n.d.
60 “Tackle” Bronze Sculpture, 2 in. x 5 in. n.d.
61 “The Upright Discus Thrower” Bronze Sculpture, 10 in. n.d.
62 “Wathching the Pole Vault” Bronze Sculpture, 10 in. n.d.
63 “Winded” Bronze Sculpture, 10 in. n.d.
64 “The Winner” Bronze Sculpture, 12 in. n.d.
65 “Wounded” Bronze Sculpture, 10 in. n.d.
66 “Grotesque Group of Wrestlers” Bronze Sculptures, 10 in. n.d.
68 Oil Portrait of R. Tait McKenzie by Mourice Molarsky n.d.
69 “Line Play” Percy D. Houghton Memorial Plaster Relief, 57 in. x 27 in. n.d.
70 “Punt” Percy D. Houghton Memorial Plaster Relief, 57 in. x 27 in. n.d.
71 “Candlesticks” Bronze Sculpture, 12 in. n.d.
72 “The Boy Scout” Bronze Sculpture, 16 in. n.d.
73 “Clarence S. Bayne, Class of 1895” Plaster Relief, 20 in. x 41 in. n.d.
74 Ellwood Charles Rutschman, Father of Penn Basketball Bronze Medallion, 33 in. diameter n.d.
75 “American Academy of Physical Education” Bronze Medallino (seal), 10 in. diameter n.d.
76 “Sesquicentennial” Bronze Sports Medal, 13 in. diameter n.d.
77 “Relay Runners” Bronze Medal, 8″ diameter n.d.
78 “William Patrick McKenzie” Plaster Sculpture, 19 in. x 14 in. n.d.
79 “Wisconsin Palmam Qui Mervit Ferat” Bronze Sculpture, 9 in. x 5 1/2 in. n.d.
80 “Fencing Club of Philadelphia” Bronze Medallion, 7 in. diameter n.d.
81 “Winter Sports” White Marble Sculpture, 9 in. x 6 in. n.d.
82 “Blighty” Bronze Sculpture, 15 in. n.d.
83 “John McLure Hamilton” Bronze Medallion, 11 in. diameter n.d.
84 “Hector MacQuarrie” Bronze Sculpture, 12 in. x 8 1/2 in. n.d.
85 “Miss Katharine Clark” Bronze Medallion, 9 1/2 in. diameter n.d.
86 “Frederick Wolle” Bronze Medallion, 11 1/2 in. diameter n.d.
87 “Arthur E. Shipley” Bronze Color Plaster Medallion, 11 1/2 in. diameter n.d.
88 “Ethel O’Neil” (Mrs. R. Tait McKenzie) Plague (stone), 12 in. x 17 in. n.d.
89 “Lenape Club 1911” Bronze Medallion, 6 1/4 in. diameter n.d.
90 “Jacobs Bond 1908” Bronze Color Plaster Medallion, 13 1/4 inc. diameter n.d.